We pride ourselves on community building. Saber enthusiasts like to partake beyond learning just how to choreography combat. 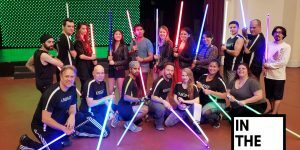 We pride ourselves in knowledge in the Lore of what we study as well as partaking in public events – such as empowering folks in the community by teaching them the ways of the saber, making appearances at local businesses to help out in a community event or pulling in together for members in need. 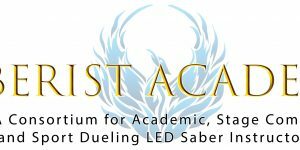 As a Knight, you move up in ranks based upon skills you learn in class, performances you do in public and contributions you make both to the class and the saber community. With that in mind, we have established a series of Belt-making Workshops, whereby you attend a night with friends in SaberCraft and you work together to create the belts used by yourself and others. You help forge the belts of the system and leave a mark in every belt that is distributed. As the ranking system has 4 belts representing the different levels of the Knight, these belts are fashioned in a similar manner. Not mass-reproduced. Each one hand-crafted. The belts are modeled as simple unbleached cloth with a number of stripes across representing the rank. Knights are encouraged to wear their belt at cosplay events to demonstrate their pride in the organization and what we do. 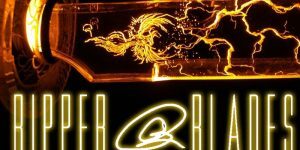 It’s also a symbol to reflect the time and dedication spent by the Knight. Rather than use mass-produced stiff martial arts belts, we pride ourselves in building our unique system to stand apart from all other systems out there. We pride ourselves in empowering our members in contributing to the team and helping it grow. We also encourage the development of a “Public-Belt” or “Con-Belt”. These are unique belts that are crafted to suit your particular cos-play design. If you are working on another character-type, say of a completely different genre, style or alignment and choose dark colors to represent your rank in the Knights, you can choose the color & fabric of your belt and by participating in Belt-Making sessions, you bring the materials and it is thrown in the queue to be created that night. Best of all, the belt will be built to be updated with additional stripes as you go up in ranks. Everyone involved will cover 1 step and continue to do that step for the entire portion of the evening (2-3 hours) while we enjoy each other’s company and share some food and refreshments. It’s an evening of fellowship where we enjoy each other’s company and help build the future of development and the future of the organization. Attend one day or attend both days. RSVP today. Update: See the Results of our belts. Not a Knight yet? Don’t delay and join today.